Last year (4/2013) I attended the Type-A Advance Bootcamp in Philly. I had been to other conferences... but when I attended the Philly mini 1 day conference I suddenly felt like I had finally found my people. For whatever reason, I felt more at ease. There was a smaller group, it seemed less rushed (even in 1 day), it seemed more mellow, I was able to be more focused. I left that day feeling like I had learned more and had connected more. I left that day knowing I just HAD to attend the full conference in Atlanta. When I attended Type-A in Atlanta (9/2013) I wasn't sure if I would get the same feeling. It was a full conference. 3 days. More people. More sessions. Just MORE. I was prepared for more of the big conference chaos feeling. I was so pleasantly surprised when I ended up having that same feeling of coming home to my people. It just felt different than the other conferences. Don't get me wrong... I've loved things about all of the conferences and events I've attended. There is just something special about Type-A. Each night I had dinner with other women that I feel connected to now. Each day I found myself sitting with friends... not just random bloggers. Everyone was just NICE. Some other special things for me about Type-A 2013? I got to meet Dorothy Hamill (who I've loved forever). I got to have dinner with Vanessa (my college roomie) who I hadn't seen in WAY TOO LONG. I had a spot as a volunteer... and got to be Kelby Carr's assistant for an afternoon. So. Many. Cool. Things. 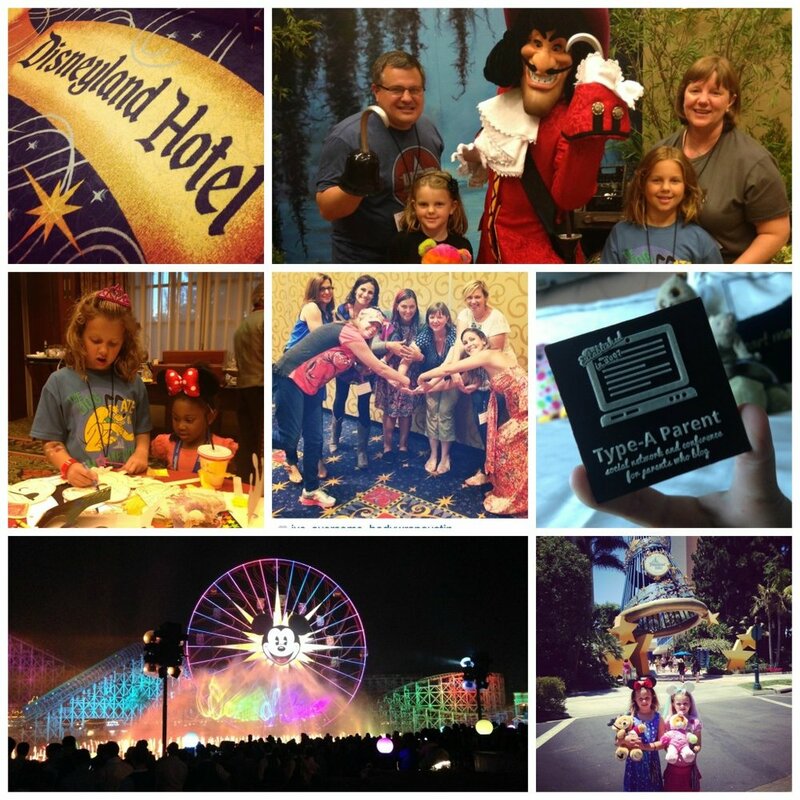 My whole family just attended Type-A Disneyland in July. Now even Nick and the girls know how awesome a Type-A conference is. Zoe and Ana had an absolute blast in KidCon. Zoe was actually upset it was only a 1 day thing. She really wanted to go back the next day. When we came home Zoe actually had me set up her own blog... and now Ana is begging to blog too! Nick was able to attend the evening events with a spouse pass. He was truly impressed with the event and the people involved. I love that Type-A has also made my family feel so welcome. So... no matter how many blog conferences and events I've attended this year... I had immediately decided I would be attending Type-A in Atlanta again this year. My pass was purchased. My room reserved. My plane ticket booked. Than today.... I got some awesome Type-A news. I got an e-mail saying "Hello and thank you for applying to be a blog partner providing onsite services at the 6th Annual Type-A Parent Conference in Atlanta on September 19 through 21. We would love to have you!" So... once again I get to help out at the conference at Atlanta. I don't know what I'll be doing yet... but I love that I get a little behind the scenes action at the conference again. AND... I get to pass a little bit of Type-A goodness onto you all! If you've been thinking about joining the Type-A Parent Conference this September (9/19-21 at the Grand Hyatt Buckhead) now is the time to purchase your pass! For the next 24 hours you can receive 25% off the price of the conference pass. Simply go to the registration page and enter the code BLOGPARTNER. And then... let me know you're going to Atlanta! We can meet up! Type-A Parent Conference, in its sixth year, is the world’s largest conference for parent bloggers. The conference has a well-established reputation for outstanding learning with actionable takeaways. It features power networking with the best and brightest parents who blog plus the major brands and firms who want to engage them. Type-A is where influential digital parents grow their business and connect. Register at Eventbrite. Use code BLOGPARTNER to get 25% off for 24 hours only!